You may have noticed we’re having a festival. 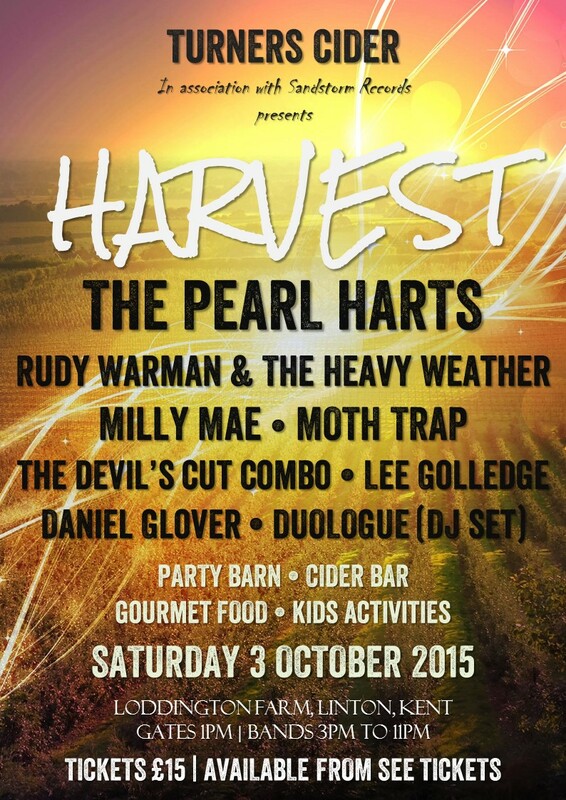 It’s a celebration of music and musicians and of cider and of having a good time. We’ve got a few surprises up our sleeve, but we’ve already announced a fantastic line up that should secure a great crowd. It’s a really young exciting line up of original artists. We’re so proud to have them playing the first Harvest Music Festival. If you want to come along make sure you buy a ticket in advance from See Tickets to avoid missing out. We’re going to have a party. You don’t want to miss it! We’ve had a few compliments on our labels so I thought I’d share how the design came about. And then we added the words that got across what we wanted to say about our cider. As with Bob Dylan’s Like a Rolling Stone this started out as a lengthy discourse on the nature of the thing (Bob started out with a 20 page long “piece of vomit” about the spoiled brat Miss Lonely that he pared down into the greatest song of all time). And that got cut and cut until we were left with the minimal amount of words required. Those words were “made with 100% Kentish apples”. Those few words tell you a lot about our cider. They tell you its a craft product. Craft to me means handmade, by me, with care and attention to detail in everything from the fruit we use to the methods we use to the way we package and brand the thing. 100% Kentish apples tells you that our cider is made solely from apples. (You may ask what else would it be made of, but that’s for another discussion). And that it’s a product of Kent. We use only Kentish dessert and culinary fruit, no bittersweet apples. Not because we don’t like bittersweets, but because we want to use local apples and we like the light, refreshing “Eastern counties” style of cider they produce. The final thing to put on the label was a name. I toyed with a list of names, most of them ridiculous, in hindsight. But in the end it was an easy decision. On a visit to Jersey my old school friend (a ‘Thorp’) said you’re a Turner, that’s a great English name. If you’re proud of your product and your business, you put your name on it. That’s what people have always done. I was persuaded. And because we’re so proud of our village and its appley heritage we added “Marden, Kent”. We put all those words in the font we use. It’s called Veneer and we like it because it reminds us of the writing on our traditional apple bins and crates. And then we stopped. We didn’t add anything else, no pictures, no stories. There are a couple of things we haven’t added but perhaps should. We don’t have an ingredients list. We’re not obliged to (which is, arguably, odd), though we’ve got nothing to hide. Our cider contains apples, sulphites (which have been used for centuries to kill off any bacteria) and pectolase (which helps the juice clear). We haven’t said that our cider is unfiltered. And we haven’t said that it’s unpasteurised, though I expect that as we grow and sell to more retailers we’ll start to pasteurise. We’ve just dropped 40 litres of Turners Cider at Merton Farm in Canterbury for the 40th Kent CAMRA beer festival. It gets going tonight and runs til Saturday night. To mark the anniversary they tell us they’ve got 40 ciders (most from Kent), 40 foreign beers and literally a shed load of British beers.